One of the most heated debates circling The A.V. Club offices at the moment is whether to see Kingsman: The Golden Circle, the sequel to 2015’s Kingsman: The Secret Service premiering this weekend. Our own film editor, A.A. Dowd: not a fan of the original. But some of the rest of us either think it’s a great movie, think it’s not a great movie but still tremendously enjoyable, or frankly just want to see that pug dog in a suit. At any rate, it’s a good time to enjoy ScreenCrush’s look back at the first Kingsman movie and partly what made it so successful: namely, a multitude of James Bond references that are either ripoffs or homages, depending on your Kingsman feelings. Of course, the movie does come right out and talk about those early Bond movies, especially during one-on-one scenes between Colin Firth’s Galahad and megalomaniac villain Valentine, played by Samuel L. Jackson. At one point they talk about the “gentleman spy” films before dinner, just as Bond frequently dined with the man who was trying to kill him. 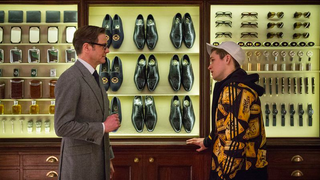 Perhaps most commendable is Kingsman’s immense variety of secret gadgets, many of which have roots in the Bond universe, like the shoe with a knife in it or the exploding pen or super-powerful ring. ScreenCrush goes even further, suggesting that Kingsman revolving spies under the same code names (like Lancelot and Galahad) might be a nod to the theory that the six onscreen James Bonds all just used Bond as a code name, which helps explain the lengthy cast of lead characters. Like Bond adventures, the movie features exciting activities like skiing, space travel, and skydiving without a chute. And of course, in its much-contested ending, Eggsy (Taron Egerton) ends up with an about-to-be-naked beautiful woman, just as Bond ended so many of his missions. The movie even goes on to nod to other spies who came before; for example, the Kingsman glasses and the real name of Firth’s Galahad, Harry, both point to fictional British Cold War spy Harry Palmer, who was portrayed by none other than Michael Caine, Kingsman’s Arthur. Still, as the video points out, the fun of Kingsman is that it acknowledges those many similarities and then subverts them, like when Valentine says that in a Bond movie he would tell Galahad how he was going to kill him and give him ample time to escape. Instead, Valentine just shoots him in the head. And yet, Firth shows up in the Kingsman: The Golden Circle trailer. Sorry Dowd, but we’ll probably end up catching this movie before the weekend is over to see how this all plays out.